Over the past two decades social media has proven that it’s quite a beneficial investment. Just look around and you’ll see how involved it is in daily life. For your business this means getting your message to the right people at the right time to increase sales. However, this isn’t the only benefit you can reap here. It’s faster and easier for customers to contact customer service representatives. This gives you a clearer view of any grievances faster than in the past. Oftentimes this can all be handled without picking up the phone and still be handled in real time. There are still some people in the world it’s challenging to directly communicate with today. For instance, the average person will never interact with high-profile personalities. However, social media makes this all possible. Communicating in this way isn’t only fun, it also opens new possibilities in the way of networking and partnerships. This is very beneficial to your brand in terms of increased branding, backlinks, referral visits, and shout outs. 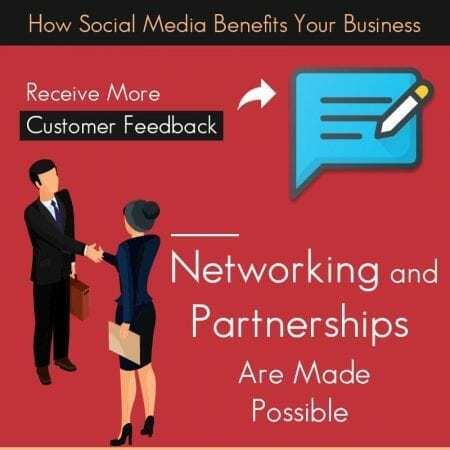 These connections also garner your brand more trust and opens even more business opportunities to you. There’s a lot of value available here. For instance, you probably already realize that increasing your number of backlinks will also boost your SEO. However, this isn’t all that you’ll receive. Social media also sends signals (e.g. relevancy) to the search engines so that your content is seen as popular, making it more visible and shareable. Google freely admits that getting favorites, likes, and shares will help you move up in the SERPs. While these don’t have the same “power” as backlinks, they are valuable and will help you. You can think of your social media presence as supplementing your brand’s website and physical location. Each of these reaches out to a different audience in a useful or entertaining way. Oftentimes this is a great way to reach out and engage with people who you wouldn’t get to know otherwise. Regardless of what industry you’re in, you must focus on your customer. Success here is achieved by understanding and delivering the best customer service experience possible. As such, you must do everything in your power to ensure this happens. This is why your reaction to your customers’ feedback (regardless of how good or bad it is) is imperative to your success and reputation. With social media you’ll have a platform that will help you with these things since you can now interact with your customers in a way that wasn’t possible in the past. You should embrace this opportunity to build your brand, listen to your customer, and create a great reputation for yourself. These channels also help you understand what marketing tactics and practices are working and which ones our direct competitors are utilizing. Ultimately, your goal should be to have your customer understand you and depend on you instead of depending on your competition. Of course, this is also your competition’s goal so it’s important to monitor how you can better educate and entertain your visitors, learn what you do well, and figure out how to do things better. Branding involves utilizing many platforms (e.g. paid search, organic search, social marketing) regardless of how high or low your conversion rates are on such platforms. With social media you’ll have a great opportunity to enhance and showcase your reputation as you talk to your customers and what’s important to them. This is also your opportunity to make sure you’re at the forefront of their mind when they’re ready to buy something. To make this work for you, it’s important to understand what each platform does well, what demographics use it, and what types of content are generally found there so you can tailor your messaging as such. Just like with SEO, every business will perform differently here as well. This is mainly because your goals and the way you measure success is different from your competitors. When you’re ready to check these things out for yourself, contact the Local SEO Tampa Company. We’ve helped many companies become successful by implementing some basics. We look forward to helping yours too. Next PostNext The Great Debate: Is SEO Dying?